Perhaps I'm unreasonable, but if humanity is ever to land on Mars and colonize it, we must first make it widely known that the portrait of Mars painted by NASA, JPL, the Remote Environmental Monitoring Station (REMS) Team for the Mars Science Laboratory (MSL) rover Curiosity, and Ashima Research is simply wrong. It doesn’t explain the weather plainly seen. We must expose why they are wrong, and find the motivation for disinformation to ensure that the enemies of progress are stopped cold. This report will first explore the easiest to prove aspects of disinformation - sunrise and sunset times at MSL, winds, and relative humidity. It will then move on to atmospheric pressure errors, and finally point the way to a possible explanation for a pattern of deception that has roots back to at least 1976. Much more is known about the motivation for errors than is presented on this site. I do discuss what I know in much more detail on MarsCorrect.com, but how long it remains there depends upon wither how long the Government permits it to be there or upon what jobs, if any, are offered to my son at NASA or at other Government agencies, or to me in the Trump Administration. This report's conclusion represents the opinion of Barry S. Roffman. It's based on research begun in conjunction with my son, David, who in part due to disgust over the way Mars research has been conducted in the United States, has left the field of space physics; however, after a lot of nagging, I did get him to apply his knowledge to check the results that I derived for estimating the length of Martian daylight. His results, presented below, are remarkably similar to what I derived by an entirely different technique. After a fellowship at CERN in Geneva, David moved on to a PhD in condensed mater theory physics, but on December 1, 2016 he starts a post doc at Yale Medical School. There he will do research in the field of therapeutic radiology where he will use data mining to predicting cancer risks. As such, unless you have a job offer for David, all correspondence in reference to the facts and opinions stated herein about Mars should be directed solely to me at BarrySRoffman@Gmail.Com. For the record, we track and record all NASA, Kremlin/Roscosmos and European Space Agency visitors to our two Mars-related sites, as well as those visitors to ArkCode.com. Our list now includes over 500 readers from them. We are well aware of which military sites track us (via the Department of Defense Network Information Center), but we do not as a rule record them. I am aware that NASA reviewed the bulk of this article earlier today (January 22, 2017). David would return to the field of space physics if there was an appealing offer. I don't know what my chances of success are, but again I applied for a job as a White House science advisor immediately upon becoming aware that our next President will be Donald Trump. My application number to work at the White House is P-0007502. For reference I indicated the U.S. military intelligences site that track us. Figure 1 above: Sunrise and sunset disinformation put out by Ashima Research. The constant wind of 7.2 km/hour is equal to the constant wind of 2 m/s shown on Figures 2 and 6. 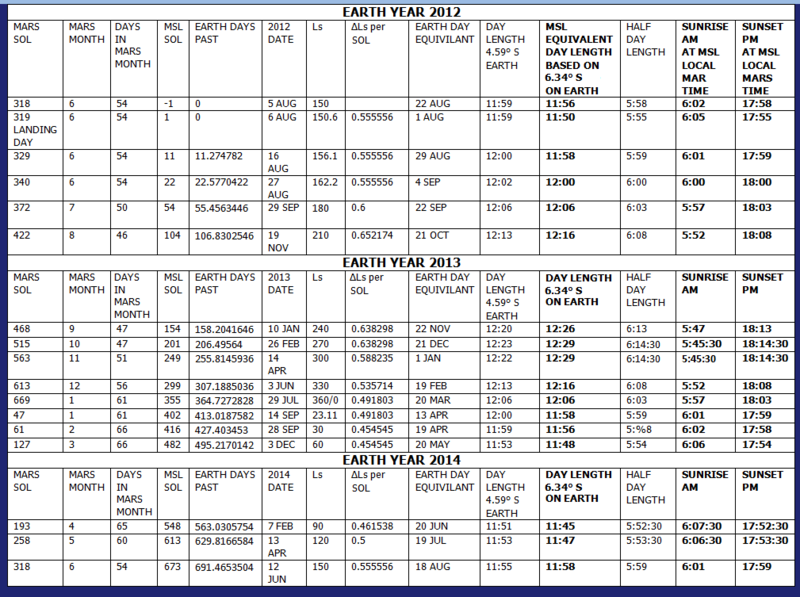 Table 1 above: Sunrise and sunset times for Mars Science Laboratory calculated by Barry S. Roffman. David's calculation further below is much more precise, but it's always nice to start with a ball park calculation, which is what Table 1 offers. 1. SUNRISE, SUNSET, SUNRISE, SUNSET, SWIFTLY FLOW THE MISTAKES. Each mistake leads us to another, laden with the Government's true fear. With the exception of MSL Sol 56, for seven months Ashima Research first published the daily MSL sunrise time as 6 am and the daily sunset time as 5 pm (11 hours of daylight, 13 of darkness). Actual local sunrise times will vary from 6:07:30 am for sunrise and sunset at 17:52:30 (11 hours 45 minutes of daylight and 12 hour 15 minutes of darkness (Ls 270) to 12 hours 29 minutes of daylight and 11 hours 31 minutes of darkness around Ls 270 with sunrise at about 5:45:30 and sunset at 18:14:30. If you look at Ashima's reports on Figure 1 you will see that the length of day figures constitute 25% of their daily reports. They were contacted by us on numerous occasions about this repeated error, but they persisted in publishing false data until May, 2013. See Table 1 for a better approximation of MSL sunrise and sunset times and Table 4 for complete accurtate daylenth calcultions for each Ls. A reasonable approximation of actual sunrise and sunset times at the Mars Science Laboratory (MSL) is based on the following initial assumptions: (1) Tilt of Earth’s axis = 23.44°. (2) Tilt of the Martian axis = 25.19°. The difference is 1.75°. (3) The latitude of MSL is 4.59° S. (4) For purposes of calculating how the length of Martian day light varies with its position in its orbit around the sun, because the Martian axis is tilted an extra 1.75°, the effective latitude of MSL for purposes of comparison with Earth will be 4.59° + 1.75° = 6.34° S. (5) Local time at MSL is based on a longitude of 0°. While Table 1 shows the local sunrise times of 4.59° S, the times offered for 6.34° S are a better approximation of what is seen at MSL. Earth’s day light was derived from a calculator at http://www.satellite-calculations.com/Satellite/Sunrise_and_sunset.htm. The entering arguments were for both 4.59° S and 6.34° S, with length of daylight displayed for both latitudes and emphasis on 6.34° S. It is further assumed that local apparent noon is half way through the day length, and that therefore local sunrise occurs at a time that corresponds to local apparent noon minus half the daylight while local sunset occurs at a time corresponding to local apparent noon plus half the daylight hours. From these assumptions it can quickly be seen that in contrast to disinformation published by Ashima Research in conjunction with the Remote Environmental Monitoring Station (REMS) Team employed by NASA/JPL for publishing all weather data gathered by MSL; the length of the day does indeed vary from their constant 13 hours of night time and 11 hours of day light with a continuing sunrise at 6 am and sunset at 5 PM. In fact, the constant day length of 11 hours at MSL will never occur at MSL. The shortest daylight will be about 11 hours 45 minutes. This occurs for several days on either side of Ls 90 around February 7, 2014. The longest daylight is about 12 hours 29 minutes. This occurs for several days around Ls 270 which will occur on February 26, 2013. While there are many days when sunrise will occur near 6 am as Ashima shows from August 22, 2012 to December 31, 2012 (it was at 6 am August 26 to 27, 2012), sunset never occurs as early as 5 pm. The earliest sunset will be about 5:52:30 pm around Ls 90. That Ashima/REMS Team and JPL have been so irresponsible in publishing this basic information is merely the entering argument in our case that the NASA/JPL Emperor has no clothes, and that all pressure data published by NASA/JPL since the Vikings have landed is totally false. Our full case for this is made in our report, MARS CORRECT: CRITIQUE OF ALL NASA MARS WEATHER DATA and throughout this web site. It will briefly be summarized below too. However, while our report requires an open mind and study of all data acquired during an intensive 7 year audit of Viking lander and other pressure data, nowhere is the case easier to make that the data spoon-fed to the media and the public is utter nonsense than with the sunrise and sunset times put out by Ashima (which seems to have gone out of the Martian weather business since we began to critize their work). With this data and all the rest of the data that we present, we ask our readers to contact their elected leaders with the purpose of starting an inquiry into the many facts that were published indicating either gross incompetence or a deliberate cover-up of the real pressures on Mars. The primary purpose of our research efforts is to spur serious funding for manned missions to Mars and to ensure that any evidence uncovered having a bearing on a history of advanced life forms there will published in an honest and unclassified manner. THE CALCULATION BY DAVID A. ROFFMAN. The first step is to specify the latitude, φ. For purposes of my calculation, the latitude used was the actual latitude of the MSL on Mars, namely 4.59° South (written as -4.59). Next the declination (δ) must be calculated: δ = arcsin((sin(25.19)*sin(λsun)). The required input is the Ls, which is λsun. The hour angle is then H = arccos((SIN(-.17) - SIN(φ)*SIN(δ))/(COS(φ)*COS(δ))). This output must be in degrees. The text speaks of calculating the solar transit (local noon). However, it also notes that the sunrise and sunset times are the local noon time -/+ 1.027491*H/360. By taking the equations for sunrise and sunset times (the actual formulae for the Julian dates are irrelevant as they share a common term that will be canceled) and subtracting the sunrise from the sunset one, a number is obtained. This is the time interval between the sunset and sunrise times, and is hence the length of day. The length of day is: 2*1.027491*H/360. Multiply by 24 to get hours. Issues considered by Barry Roffman in refining the sunrise sunset calculations. If you look at the part of Figure 2 that shows the sole exception to Ashima’s reports about 13 hour nights and 11 hour days (Sol 56 on October 2, 2012) you can get an idea of how difficult that it was for Ashima to nail down sunrise and sunset times at MSL. Was their estimate that sunrise would occur at 5:31 am and sunset at 5:09 pm correct for that day? No. That amounts to 11 hours 38 minutes of daylight. In accordance with my son's calculation, that would equate to a sol with about 12 hours 1 minute 41 seconds of daylight when the planet was at Ls 181.2. This would be only three days after the southern hemisphere had just left the winter and entered the spring. At the equinox we expect daylight and hours after daylight to be close to 12 hour each. My cruder method indicated 12 hour 7 minutes of daylight for Sol 56, so there was a 5 minute 19 second difference between our methods (amounting to a little less than a 3 minute disagreement for sunrise and sunset), but a 23 minute error for daylight by Ashima, whose error grew to over 1 hour 19 minutes of daylight at Ls 270. “Sunrise: 6:56 a.m. Sunset: 7:04 p.m.. So if there isn't equal parts of daylight and darkness on Saturday, why is it the equinox? The day we have 12 hours of daylight and 12 hours of darkness actually falls on Tuesday, Sept. 25. Sunrise: 6:59 a.m. Sunset: 7:00 p.m. Shouldn't Tuesday be the autumnal equinox? Well, we have the atmosphere to thank for this oddity. Also, the definition of sunrise and sunset. Sunrise occurs the moment the tip of the sun can be seen on the horizon and sunset is the last minute the sun can be seen before it dips below the horizon. Also, keep in mind our atmosphere refracts, or bends, light, which makes it appear as if the sun is rising or setting earlier. The true equinox occurs when the center of the sun's disk crosses the celestial equator and this occurs at 10:59 a.m. EDT on September 22. At the same time the equinox occurs in D.C., it occurs across the globe. So we have two slightly complicating factors, although the sun subtends less of an angle from Mars than it does from Earth. However, Mars also turns about 37 minutes slower than Earth does each day. This leads to a question of how to measure time on Mars. When we performed an extensive audit of Viking lander pressures and temperatures for our Report, we used the Viking Project time scheme of 25 time bins per Martian sol, each with about 59 minutes in them. However, for purposes of times quoted in my article, I assume 24 hour on Mars, with each hour having 60 minutes but with each minute having a greater duration than on Earth (each Mars second will be about 1.02583333 Earth seconds). The goal here is for a sense of proportionality. So 12 hours and 10 minutes of daylight in this scheme will actually be equal to about 5.5 seconds longer than on Earth. The bottom line on the issue of Sol 56 on Mars is this. MSL landed close to the equator (4.59°). Each degree of latitude change in Mars is only about 59 km. So that's just 270.81 km (169.25 miles) from the equator. Although the tilt of Mars' axis is 1.75° more than Earth's, this will not be a significant factor around the solstices so close to the equator. The length of the Martian day this close to the solstice at Ls 181.2 will be close to 12 hours. Obviously, this is also also true for the day before and after Sol 56, when Ashima reported 13 hours of night for each sol as it did for all other sols until at least Sol 222 on March 23, 2013. See Figure 2. TABLE 4: The following chart can be used to relate Martian Ls to hours and minutes of daylight at the latitude (4.59 South) of the Mars Science Laboratory rover Curiosity.